Please use this secure form to order a 728X90 (Leaderboard) Banner Ad. Select duration (1 Month, 2 Months, or 3 Months) or impressions (10K, 20K, or 30K). Prices include DISCOUNTS for increased durations of time (2 months-Save 5%; 3 months-Save 10%) or impressions (20K-Save 5%; 30K-Save 10%). 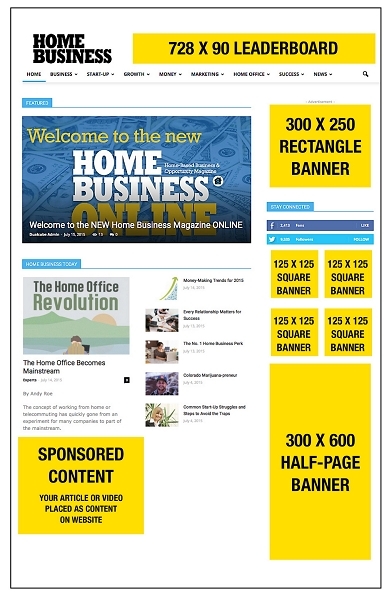 Home Business Online is Fully RESPONSIVE: Website (including Banner Ads) adjust to size of a mobile device viewing screen, whether full desktop, tablet, Smartphone, iPhone, or other mobile viewing device size. Satisfaction Guaranteed: Cancel anytime and receive a full refund on the unused portion of your order.